I am delighted to be recognised by SAS as an influencer in the realms of Customer Experience, value analytics and CRM. In my collaborative role with them I have been reading the results of their recently published survey: “GDPR: The right to remain private”. 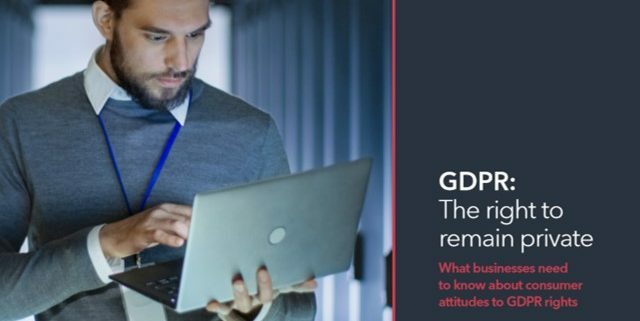 What businesses need to know about consumer attitudes to GDPR rights” – and its supporting infographic. Irrespective of the GDPR legislation, data and privacy breaches are hot news across all sectors – just check out ComputerWorld UK’s article “The most significant UK data breaches”, or BBC News’ ongoing log of data breaches. Do consumers care about their data? It should not be too much of a surprise given the media attention that one of the main findings of the report (summarised in its press release) is that 56% of consumers have already exercised their new rights or plan to do so within the next year. The research asked 10 very pertinent questions and the results from the UK and from Ireland are detailed for each question in the appendix of the report. I was fascinated to see that across the board in the general questions (2, 3, 4 & 7) about a third of UK respondents answered with “don’t know; don’t care” type answers (it’s different for Irish respondents). Some of us involved in the Data/Insight/Marketing/CRM world might be amazed that everybody isn’t fired up by GDPR, but for a piece of “techy” legislation these engagement rates are very high considering how busy everybody is and how much communication & information we now have to consume in today’s connected, digital and instant environment. What’s our customer data culture? As marketers, database managers and customer experience professionals, we have got to treat our customers’ data fairly, securely and with respect, however engaged they are. The stakes are too high to make assumptions about the robustness of our systems, processes and supplier/partner agreements. I would highly recommend that companies take a pro-active stance regarding GDPR and embrace the spirit as well as the letter of the law. The regulator and the media are on the prowl, but this isn’t just about “big stick”. A positive culture of doing the right thing for customers will always generate long-term benefits – trust, loyalty, advocacy and sustainable business performance. The survey’s findings regarding specific sectors and tolerance of decisions, mistakes, third party sharing and breaches, all point to the vital importance of trust. It never ceases to amaze me that company executives seem to only talk about trust after they’ve lost it! Like most consumers in Europe I have received numerous GDPR-related emails and correspondence in recent months from organisations that I have engaged with over the years, from big retailers to the local mechanic who services my wife’s car. Like many, I used these prompts to either confirm my permission or to get myself removed from their mailing lists – effectively cleaning up my personal inbox. A few of these simply were not relevant any more (children grown up now, etc. ), but for the vast majority my decision to continue to engage with these companies came down to how much I trusted them. This is where the SAS research hits the nail on the head in its questions, because it’s not general trust I’m talking about. It’s trust that my data will be respected; that I won’t be spammed with irrelevant offers; that my value and loyalty will be recognised in decision making; that when mistakes are made they will be acknowledged and transparently resolved. In essence this is trust in their data culture as much as their practice. What are your communications actually saying? It’s worth pausing to reflect. Are your communications giving these trust-building messages? Or are you inadvertently saying “we don’t actually care who you are, we just want to sell you stuff”? Especially if it’s part of your loyalty programme! Loads has been written about real-time personalisation, location-based services, IoT/connected devices, and “segment of one” direct marketing. It’s time to make it real before you lose the battle for trust. But in doing so you’ve got to be authentic and insight-driven. Trying to achieve these things based on poor quality, siloed data will just make you look stupid! It has never been more important to manage joined-up data and insight, and doing so gives multidimensional benefits: competitive advantage; loyalty and trust; engaged customers; reputation; sustainable growth; share of wallet; and of course, the avoidance of regulator sanction! This is where companies like SAS can help if you’re serious about leading an insight-driven and trusted organisation.